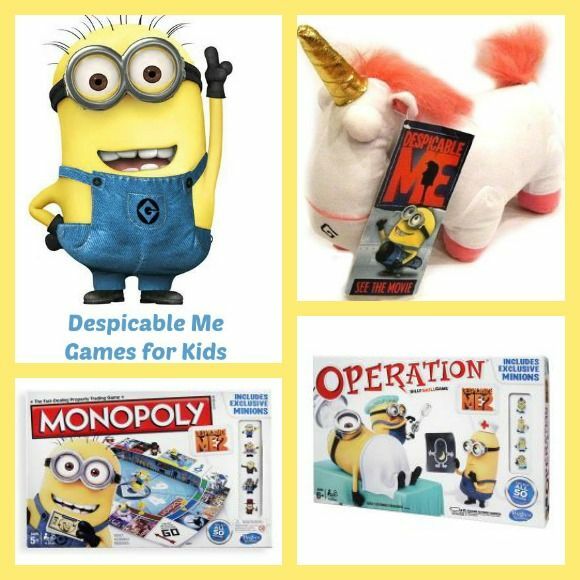 Are you looking for Despicable Me games for kids? This is the perfect time for your kids to play since the movie sequel was just released. Whether it is a board game or an activity having to do with the Despicable Me unicorn, there is something for every child. Two games for kids that have remained popular for years are Monopoly and Operation. Now, both of those board games have the Despicable Me theme. The rules haven’t changed, but if you are looking for something a bit different, you can switch things up. A fun way to make Operation fun is to try to scare the person who is working to extract the bone from the body. You know how careful you have to be so you don’t hit the buzzing edges and it will be fun to see who scares easily and who keeps their composure. The Despicable Me unicorn is a huge hit. Not only is it fuzzy and adorable, but it can be the focus of many activities. One activity is role-playing. If you are trying to teach your little one how to take turns, their new fuzzy friend can be a part of that. One of the games for kids that can be played with the Despicable Me unicorn is recalling phrases from the movie. If there is a group of children, they can gather in a circle and whoever is holding the unicorn will say part of a phrase from the film. Then whoever they pass the fuzzy toy to will have to figure out what the second part of that phrase was. One of my favorite games for kids is charades and if your children also like to play, then this is just a simple twist. Instead of a player acting out the word, phrase or activity, they will use the unicorn to act it out! Because it is plush, it can be a little more difficult, but it makes the game challenging. The above games for kids are sure to be a huge hit, whether it is Monopoly, Operation, playing with the Despicable Me unicorn or something else they create from their imaginations. Looking for more fun games for kids based on beloved characters? Check out our fun Angry Birds game! These look woonderful! we haven’t yet seen the movie…but ill have to wait for now…we just had my toddler’s birthday and we are flooded with toys…i definitely like the softy toy despicable me unicorn! The unicorn is great, isn’t it! I can understand being flooded with toys! My kids and I haven’t watched the movie yet, I want to, looks like a good one. I’m sure they’d enjoy these games, especially the Operation game! Malia recently posted..I want to be your Personal Shopper! It’s FREE! The Operation one is a lot of fun and makes it challenging! We love it, too! My kids are obsessed with the characters!